Prepare yourself for 1000 light years of laughs with the Cast and Producers of Futurama. Don’t miss out on this very special reunion of the folks who made your favorite animated science fiction TV series. 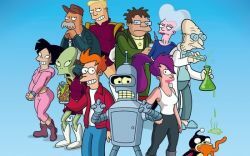 Executive Producer and Head Writer David X. Cohen will be joined on stage by cast members John DiMaggio, David Herman, Maurice LaMarche, Phil LaMarr, Tress MacNeille, and Billy West for a night of jam-packed Futurama goodness. Moderated by Producer Lee Supercinski. Be there or else!